The day before the second day of competition, thieves broke into Kelly Slater’s rented home on the North Shore and made off with a good portion of his Pipe boards. Although the theft didn’t deter Slater from moving through to the final day, North Shore locals are now on the hunt for the thieves and the stolen surfboards, according to SurfEurope.com. Normally in situations like this, the authorities would be called in to find the stolen goods. Of course this is Hawaii, so in this situation, it’s the local heavies doing the tracking. 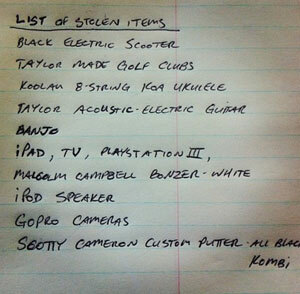 Kelly’s list of stolen items from last year’s robbery. This is not the first time Slater has been the victim of a North Shore burglary. Last year, his house was broken into, as well. The perpetrators made off with his scooter, GoPro cameras, and a Malcolm Campbell bonzer, among other things. With the monster swell hitting Hawaii’s coastline, everything is in place for the World Title showdown between Mick Fanning and Kelly Slater. The forecast calls for a 10-15 foot west swell with light offshores. If Fanning makes the semis, the title is his. If he loses, Slater needs to win the event to take the title. Either way, we’ll see a world champ chaired up the beach today, stolen boards or not.